Serenity Springs was designed and constructed by Rich and Laura Ostergren, and developed as a family business. The resort opened in 1999. Since then it has witnessed remarkable growth. Beginning with just 5 cabins, Serenity Springs now hosts 36 fully-furnished +500 sq.ft. premium cabins, 2 clubhouses nestled on +85 wooded acres, and a reputation for impeccable service and attention to detail. We’re more than just a location. Nestled on 85 private wooded acres, the romantic cabins of Serenity Springs in Michigan City, Indiana, provide a complete getaway experience. We are an award-winning resort where couples can indulge in privacy, comfort, and romance in individual cozy rental cabins, fully appointed with modern conveniences. Each private cabin features a fireplace, sunken whirlpool tub for two, flat-screen TV, DVD player, premium bedding, and our signature "butler door." 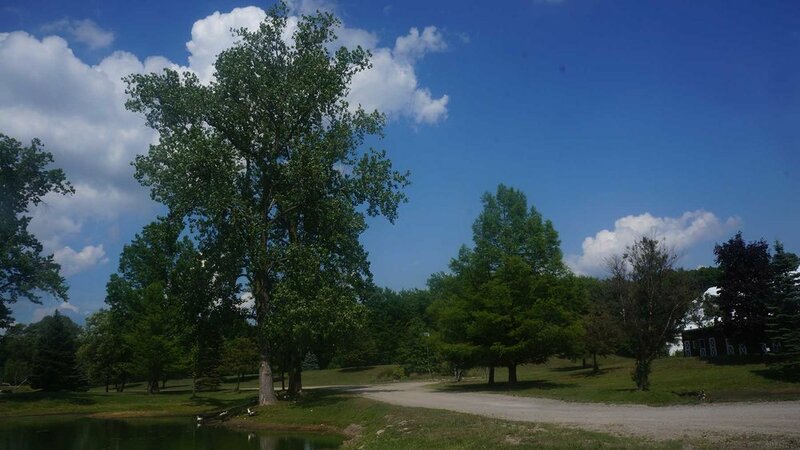 In addition to the scenic backdrop of the great outdoors, Serenity Springs is also conveniently located near the Dunes, Lake Michigan, Indianapolis, Indiana, Ann Arbor, Michigan, South Bend, Indiana, and Chicago, Illinois. 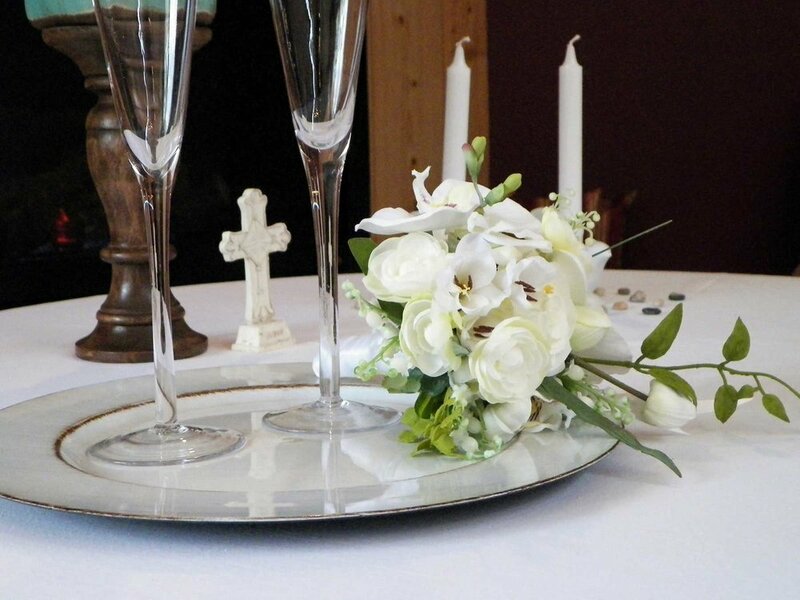 A Romantic Couple’s Retreat – Any Time of the Year! Review your calendar and pick the dates for your romantic getaway. Consider a multi-night stay to ensure ample time for exploring our pristine property and leave the rest to us! Whether you choose to stay on-site or venture out, you'll find Serenity Springs the perfect spot to relax, unwind, and reconnect with a loved one, regardless of the season. 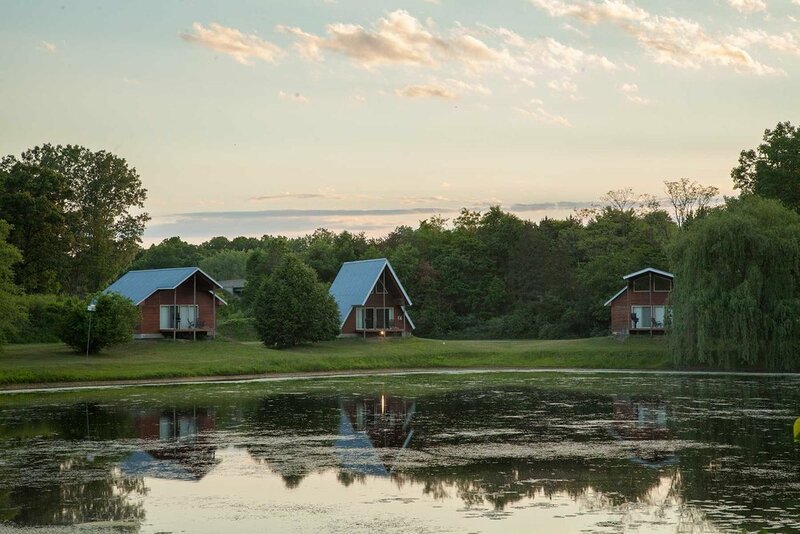 Book one of our romantic rental cabins during the warmer months and enjoy a horse-drawn carriage ride, take a leisurely walk, or ride our complimentary bikes around the lake and through the woods. Add more fun to your couple’s retreat and challenge each other or another couple to a game of corn-hole, enjoy catch and release fishing, and feed our ducks, geese, and other waterfowl with corn that we provide. As the sun sets, cuddle around the campfire on your private deck and roast s'mores, compliments of Serenity. Take a trip during the winter and you and your significant other can enjoy a one-horse open sleigh ride through the picturesque snow-covered pines. Feel free to pack your cross-country skis or we can lend you some snow shoes. Take a brisk walk through the snow-covered trails or feed our feathered friends. Feel like relaxing indoors? Stay cozy with the warmth of a beautiful fireplace and heated floors featured in your private cabin. No matter what you choose to do during your getaway, Serenity Springs is your ultimate winter romance destination. 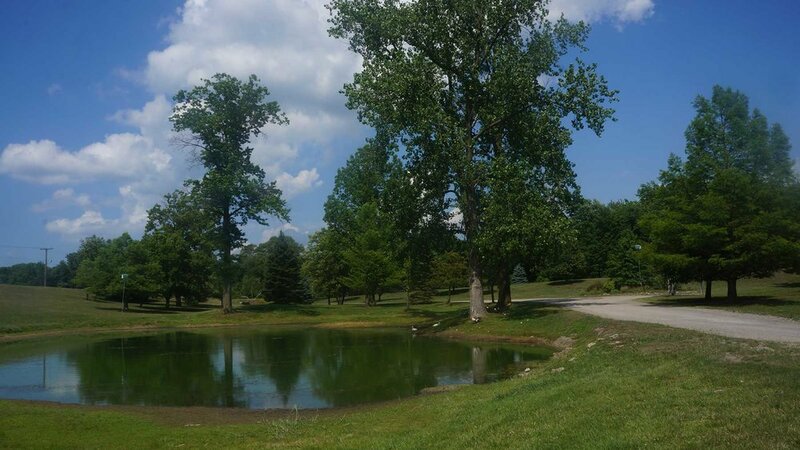 Serenity Springs is located in Michigan City, Indiana, near many local attractions, including: Blue Chip Casino, Lighthouse Place Premium Outlets, Shady Creek Winery, Indiana State Dunes and beaches, many restaurants, museums, breweries, antique shops, and much more. 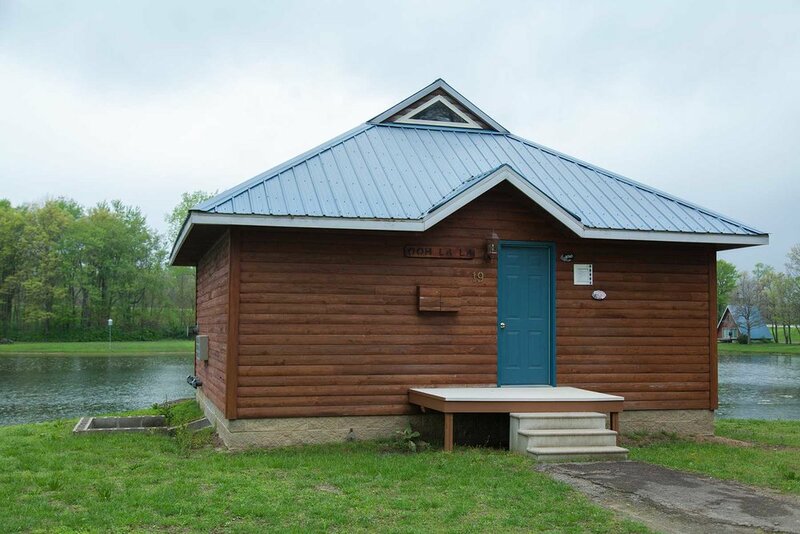 Easily accessible, our private cabins are also a short drive away from nearby Indianapolis, Indiana, Ann Arbor, Michigan, the Dunes, Lake Michigan, South Bend, Indiana, and Chicago, Illinois. Serenity Springs breathes country charm with a touch of class. 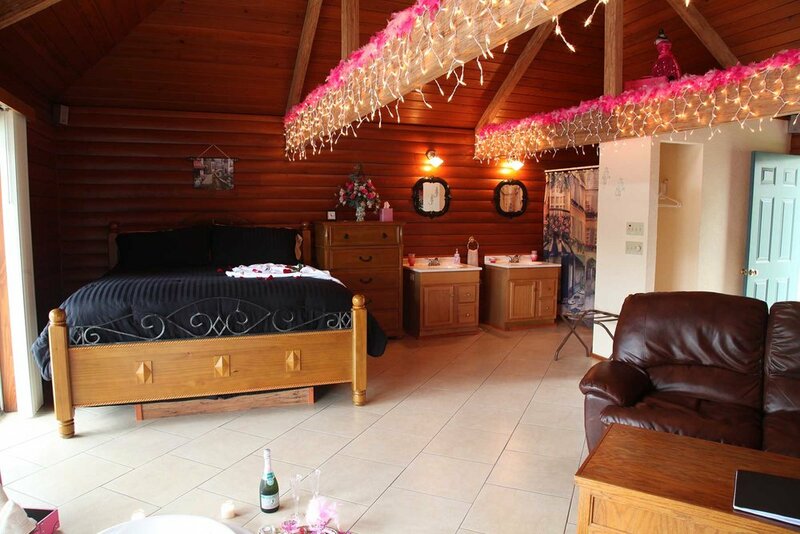 Enjoy an affordable and romantic getaway in one of our private cabins in Michigan City, Indiana, and experience award-winning Hoosier Hospitality. Come discover Michiana's hidden gem today! Call us at 219-861-0000 to book your stay.